F&I profits increased at all six of the largest public new-car retailers in the second quarter. The nation’s largest retailer, AutoNation, led the way with F&I revenue per new vehicle retailed of $1,528 on a same-store basis. The retailers improved F&I revenue amid squeezed profit margins on new light-vehicle sales, which industrywide rose 3.3 percent to 4.6 million units during the period. “With F&I as lucrative as it is, you don’t want to miss that opportunity with the sale,” John Rickel, Group 1 CFO, said in response to how Group 1, like the other publics, saw higher volume but lower new-car profit margins. 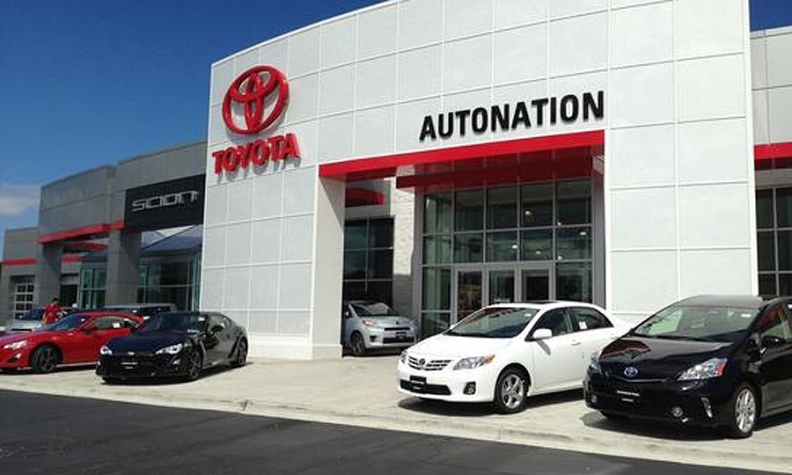 AutoNation’s revenue per vehicle improved the most, with a 9.5 percent increase over the year-earlier period. Group 1 trailed closely behind. Its revenue per vehicle was $1,525, a 4.4 percent increase from a year earlier. The main driver of strong F&I business was higher vehicle transaction prices, which increased the amount financed, Rickel said. Asbury Automotive Group’s profit per vehicle reached $1,373, an increase of 3.2 percent, while F&I profit per vehicle at Lithia Motors jumped 6.5 percent to $1,280. Sonic Automotive boosted PVR 4.6 percent to $1,274, and Penske Automotive Group inched up 1.3 percent to $1,127. Only one-third of AutoNation’s F&I profit was related to finance, COO Bill Berman said during the company’s earnings call. Two-thirds of the profit came from customer financial services products. Lithia arranged financing on 75 percent of its new-car deals, CEO Bryan DeBoer said. It sold service contracts on 45 percent and sold a lifetime oil product on 37 percent. Some executives used their latest earnings conference calls to weigh in favorably on American Honda Finance’s recent settlement with federal regulators over its lending practices. The Consumer Financial Protection Bureau and the U.S. Department of Justice charged that Honda Finance engaged in a pattern of discrimination against blacks and other minority borrowers. As part of the consent order, Honda agreed to pay $24 million to potentially affected consumers. It also agreed to cap dealer reserve at 1.25 percentage points on loans of 60 months or fewer and at 1 percentage point on loans longer than 60 months. The settlement included an option for Honda Finance to pay dealers a nondiscretionary fee – undetermined as yet -- in addition to dealer reserve. Honda said it opposes discrimination and that its lending practices have been "fair and transparent." Lithia Motors CEO Bryan DeBoer said the company likes the settlement terms. “We think it adds transparency to the consumers and actually levels the playing field a little bit competitively,” he said. Rickel said Group 1 already had similar caps on its auto loans. “This fits within the bandwidth of what we’ve been operating,” he said. AutoNation CEO Mike Jackson said he sees the settlement terms as a model for the industry. “With a little movement here and there on some details, it is going to work,” he said.